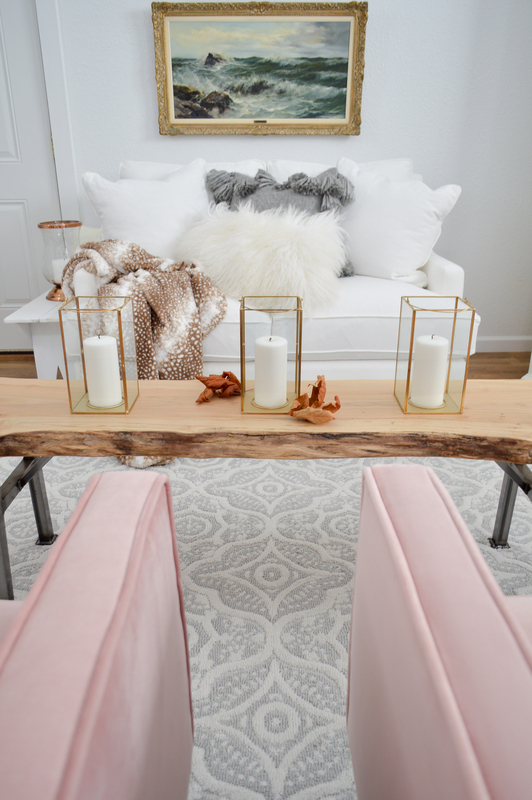 Have you been been falling for all the gorgeous new blush & pink decor we are seeing more and more of in design? I love the fresh way it’s being incorporated and how timeless and elegant it can be when it’s done right, in just the right shades. Well guess what? 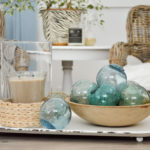 Better Homes & Gardens noticed too, in a big way… and I am so glad they did. 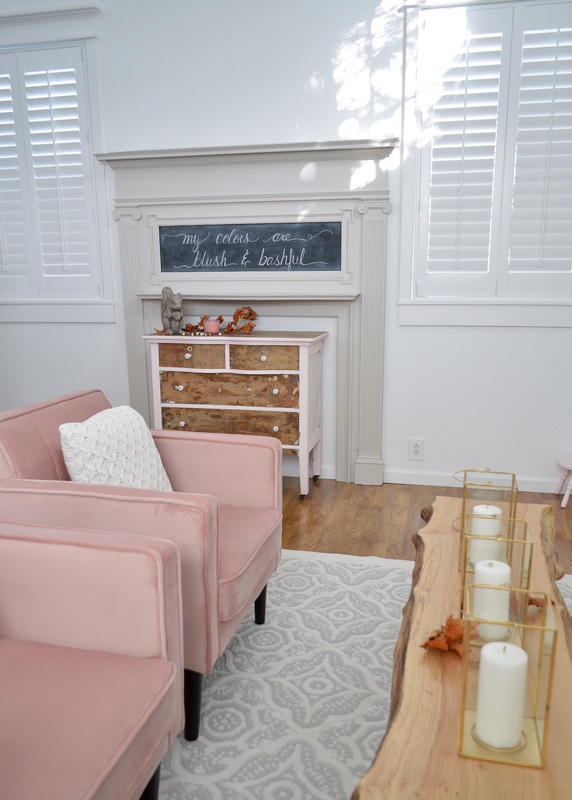 Today I’m sharing how easy it can be to slide some blush right into your home. And how lovely it looks! 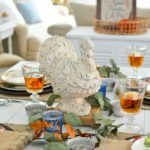 Today’s project collaboration is sponsored in partnership with Better Homes & Gardens at Walmart – Shopping links (some affiliate) are included throughout the post and at the end for your convenience. But wait. Didn’t you just see this space back in June? Yes, yes you did. 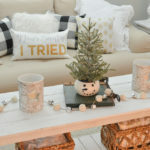 And I loved it, and I love sharing my home and decorating style with you all! 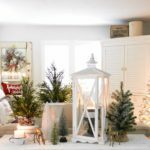 But my job, when it all boils down to it, is to share new and exciting ways to decorate our homes, and to inspire! 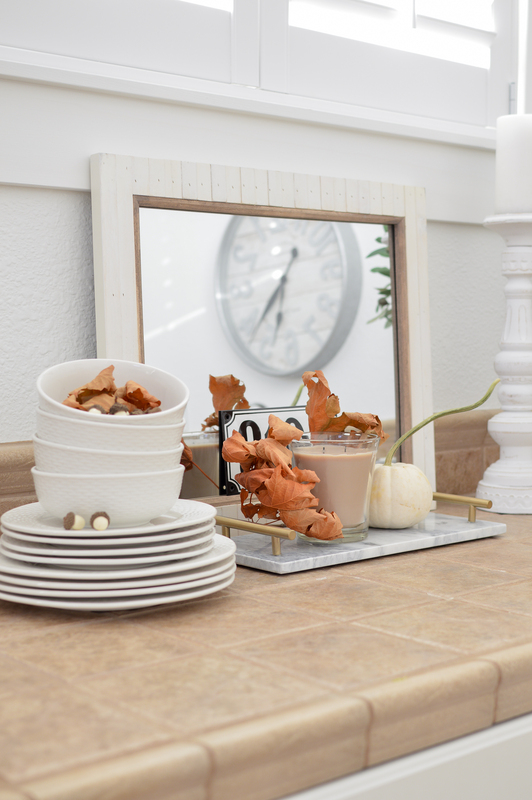 And this month I took that so much to heart, when as a brand ambassador for Better Homes & Gardens at Walmart, I was tasked with a new assignment; to decorate my home for Fall with some of the (might I say best-ever) new Fall line. 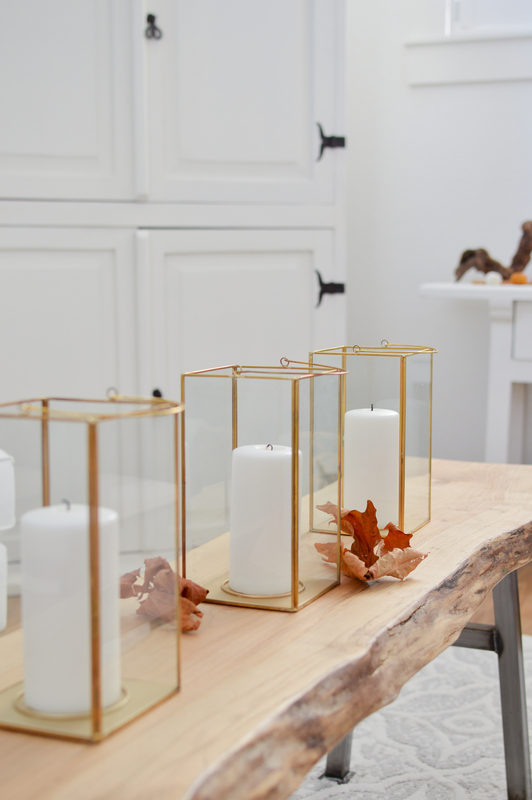 Oh I started out looking at all the traditional Fall colors and the basics like lanterns, and throws, which are always perfect to add coziness to our homes. But when I happened upon the Marlow Chair… traditional right went out the window. At lightning speed! 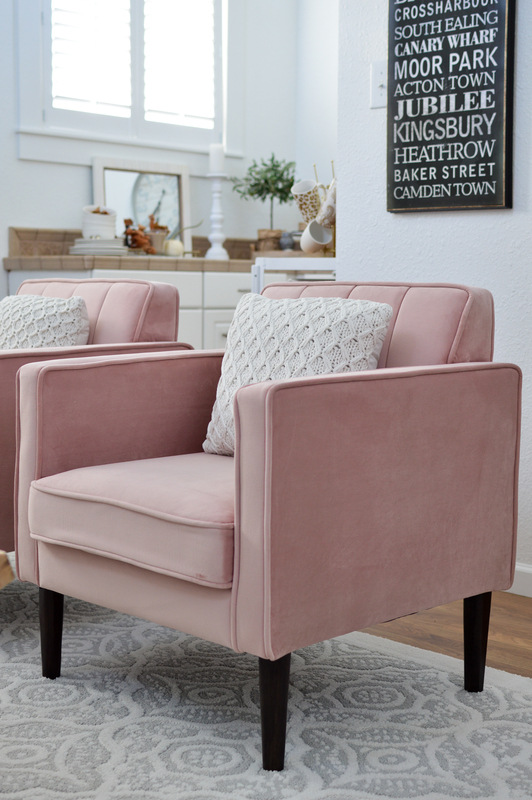 Because who can resist Pink Velvet? And I didn’t want to! Oh, it comes in a gorgeous gray.. and an emerald (gasp) and a brilliant blue, but the blush was beautiful. And I thought why play it safe? And wouldn’t it be FUN to share something a little different? And I sure hope you feel that way too! 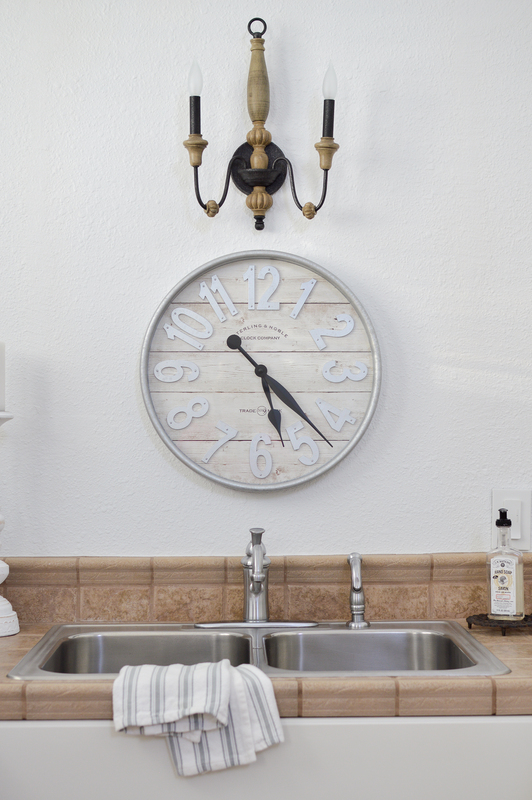 When you keep the big stuff neutral, it’s simple to change things up, relatively easily! 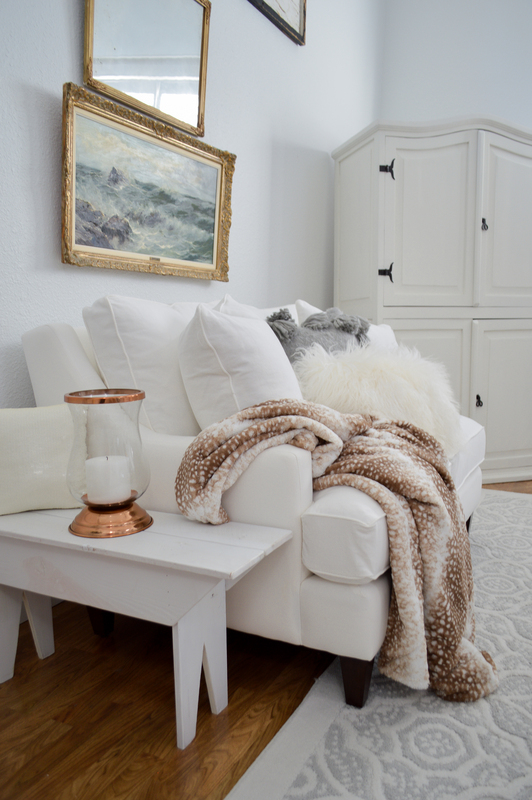 I’ve got the same sofa & the Blooming Quatrefoil Rug as last time around. 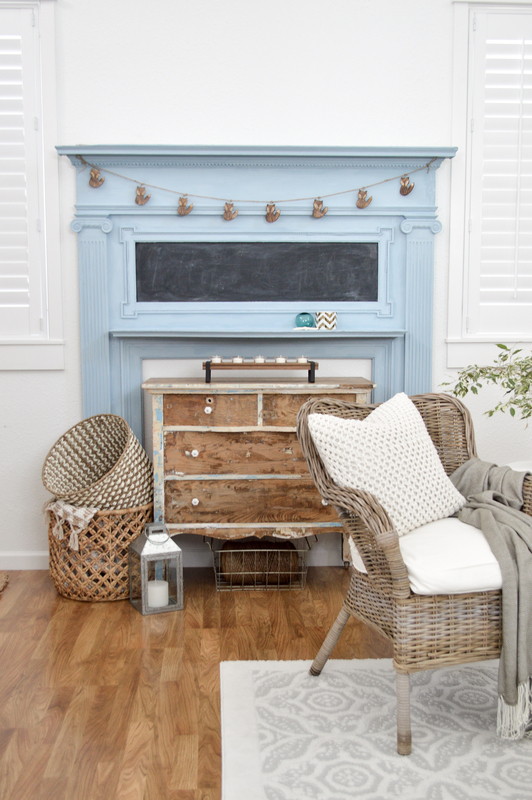 And I had already painted over the blue fireplace surround. Can you tell the blush made me a bit giddy? I couldn’t even bring myself to be a proper blogger and chalk a Fall message. You’ve got to do what you feel right? 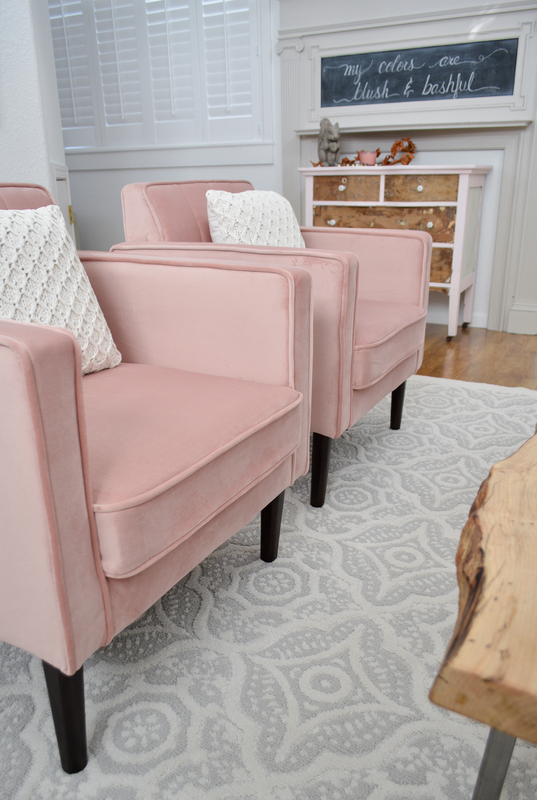 And these blush chairs just called out to me! 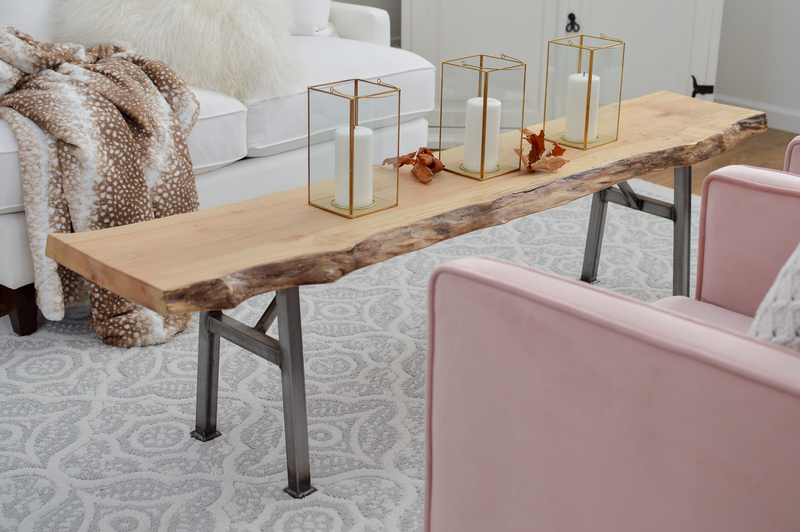 THINK OUTSIDE THE BOX: For something different, I used the live-edge bench Jimmy made as a coffee table. The scale worked, and all a coffee table needs to do is hold a magazine, book, drink, etc… and this can do that. The wood slab is completely gorgeous, but sadly too large for the main house. I was thrilled to use it here, and the delicate gold lanterns are perfect perched here. Usually at this time of year I really tend to load everything up and layer heavily, but I’ve just been feeling weighed down by too much stuff, and this softer, lighter approach felt right. 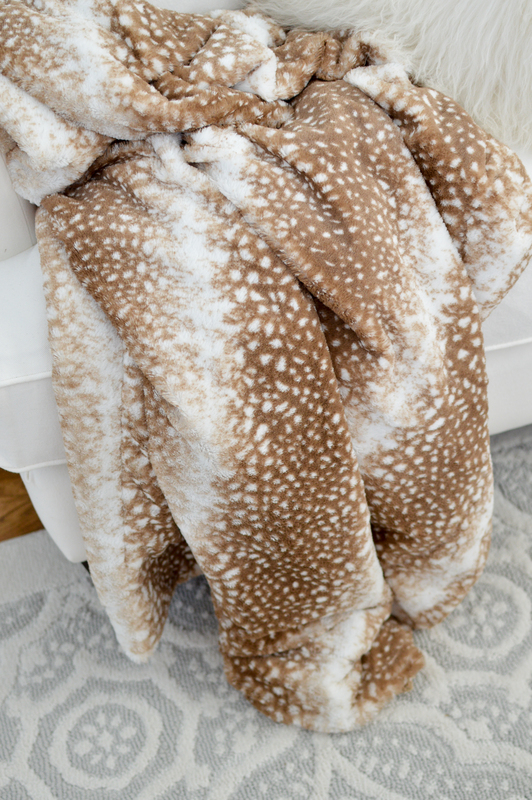 There are lots of candles, pillows & throws – so the cozy is there, it’s just a less cumbersome kind of cozy. The kitchen is ready for guests with lots of coffee & tea options and loads of mugs to select from. I fill it with snacks and waters and such when company is coming, and the cart acts as a make-shift oven, holding a microwave for now. 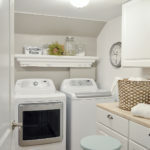 I had planned to add some simple appliances… but that wall on our home that needs to be replaced is taking major budget precedence right now. The old wood ladder and “do all things with grace” sign are happy placeholders right now. 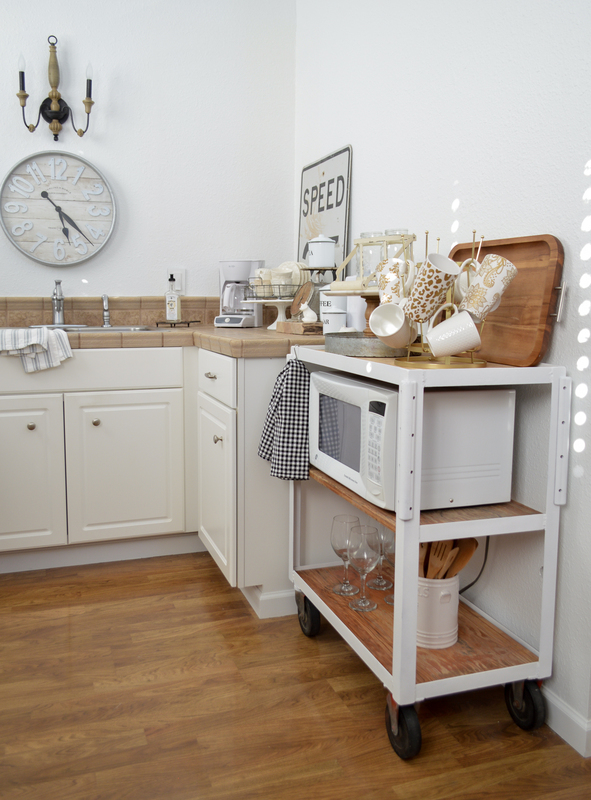 One day, the convenience of a refrigerator will be added for our guests. Maybe I’ll paint a cooler to match and tell company they can pretend they are camping. hehe. Seriously though, the king sized bed is comfy and we do have indoor plumbing, so it’s not all bad. 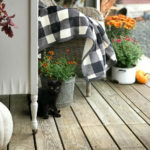 One of the wonderful things about sharing our home with all of you, is it’s kind of like having lots & lots of company over. And you know what that does! It motivates us to spruce up. 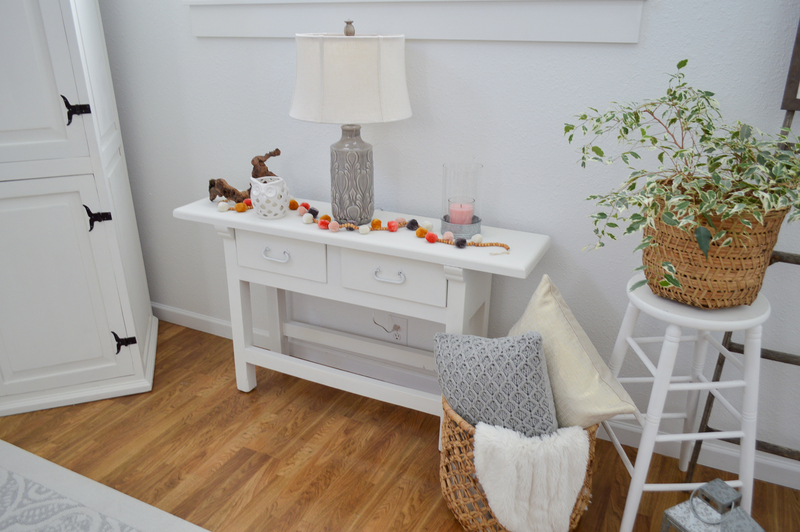 So I gave both the console table and the armoire a fresh coat of paint last week! 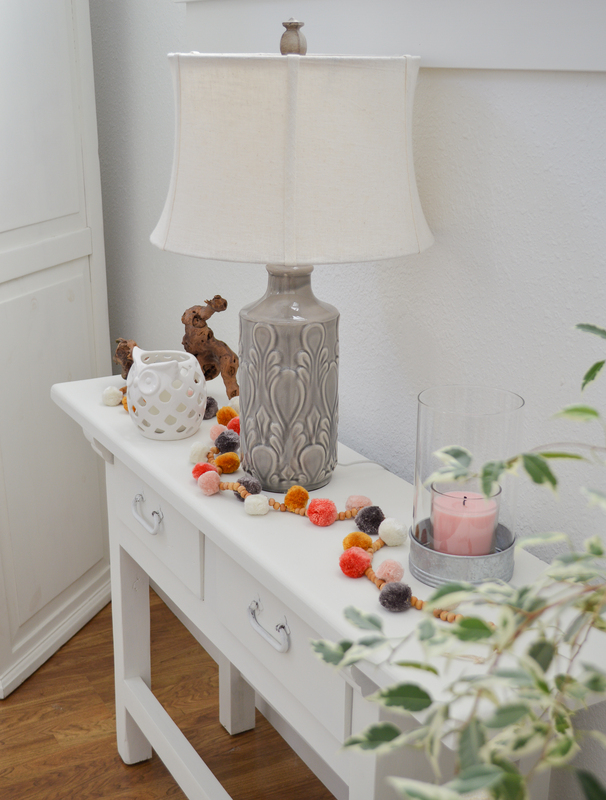 Sometimes I pick things up because they just look “happy” – like this pom-pom garland I grabbed at the very beginning of Spring. And never used. Well, I think it was meant to be! 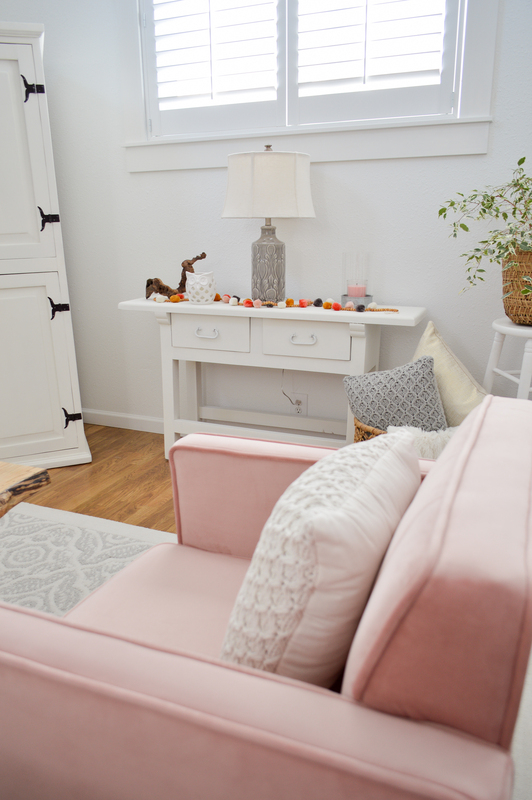 That gold pulls in the color of Fall leaves I scattered about, it’s got the grey that blends beautifully with the new Flora Lamp… and of course, there is pink. The perfect shade too! Sometimes things just have a feeling, and the colors are the wood beads feel perfect to me for this time of year even if they don’t feel traditionally Fall. Playing “musical stuff” makes my decor and furnishings works so much harder. 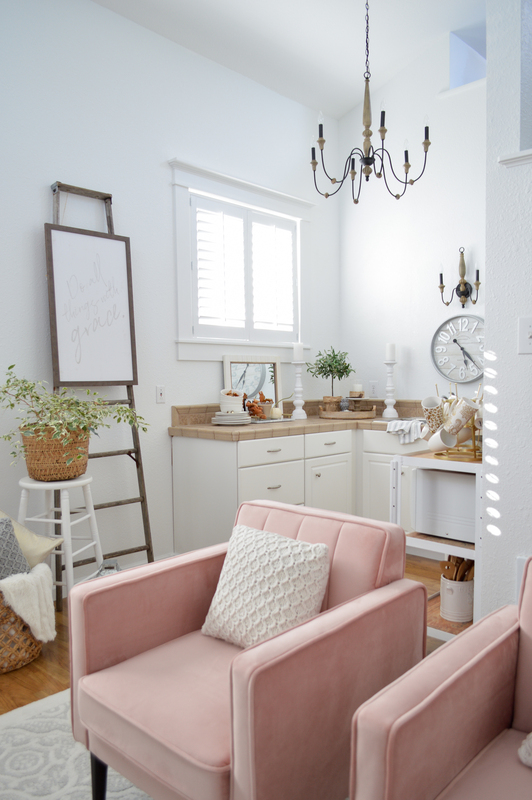 If you follow me on Instagram(where I share snippets and short video), you’ll know I sold that vintage side board that was here, that I didn’t have the heart to paint. I then stole the console from the family room down stairs at the main house. The armoire was actually wearing its original paint, and it was about 15 years old! So yeah… it really needed it! 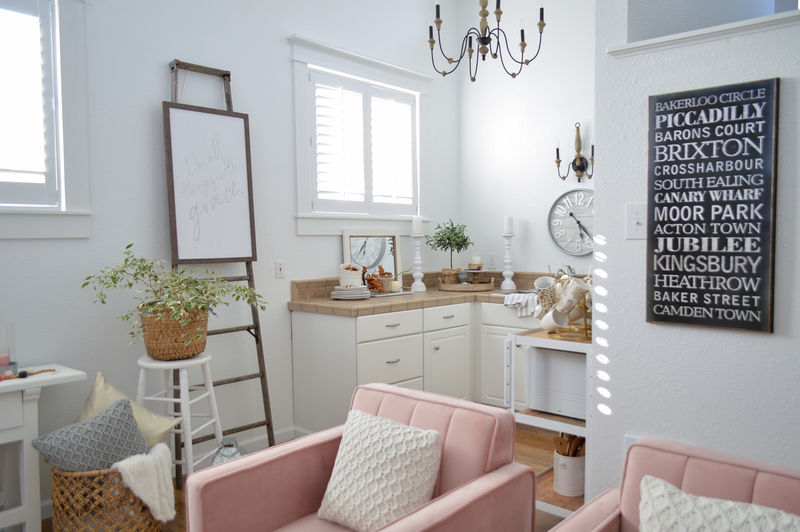 The new Ivory paint on both softened the sometimes too cool white in the room and the new shade plays really well with the pretty blush pink. I’m so happy I didn’t play it safe! 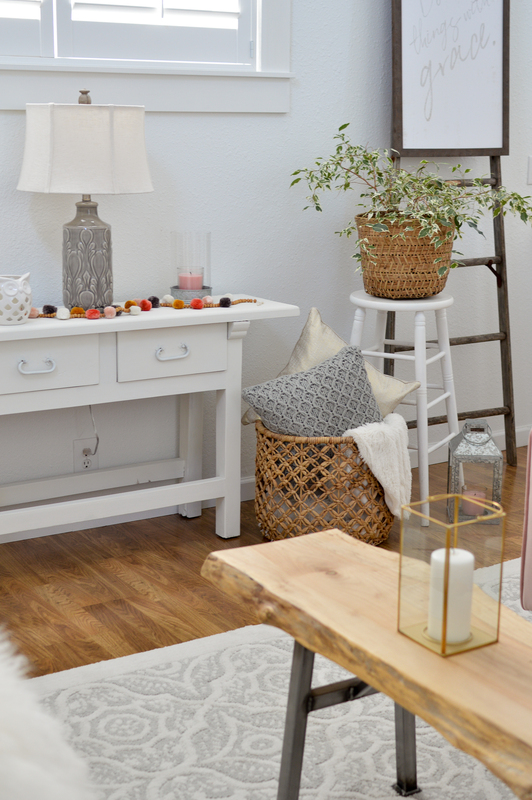 The colors and the feel of the room are light, happy and playful, and just what my heart needs right now! Don’t be afraid to buck trends and venture out of your comfort zone if something calls to you. If you see something I don’t have listed, just leave a comment and I’ll try to get right back to you! I am so pleased & feel so very blessed that I’ll be continuing to partner with Better Homes & Gardens for many more projects! I look forward to sharing them with you all, and as always, I hugely appreciate your comments, social shares and support. I’m really excited to see what you all think of the new look? 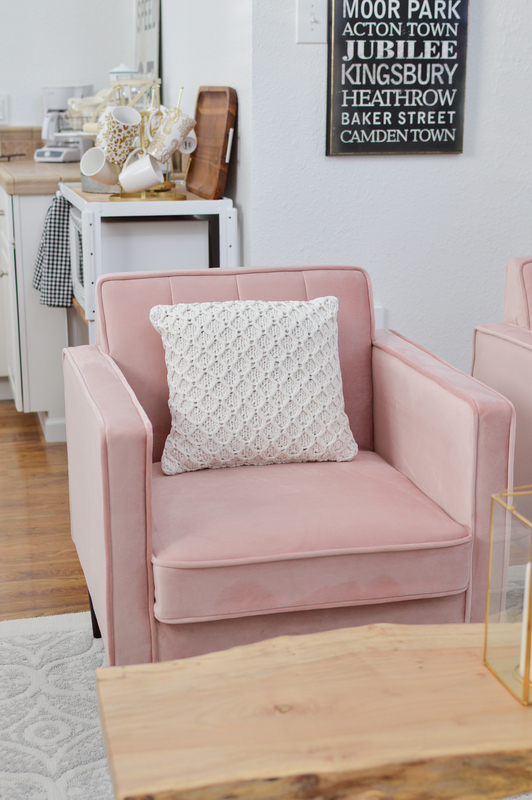 I hope you like the new blush Marlow chairs as much as I do, and I look forward to trying some more new things so I can style & review them for you, and we can stretch a bit and really explore the Better Homes & Gardens at Walmart line together! Thanks Jodie 💗 I could not resist them!!!! Hi, Shannon! 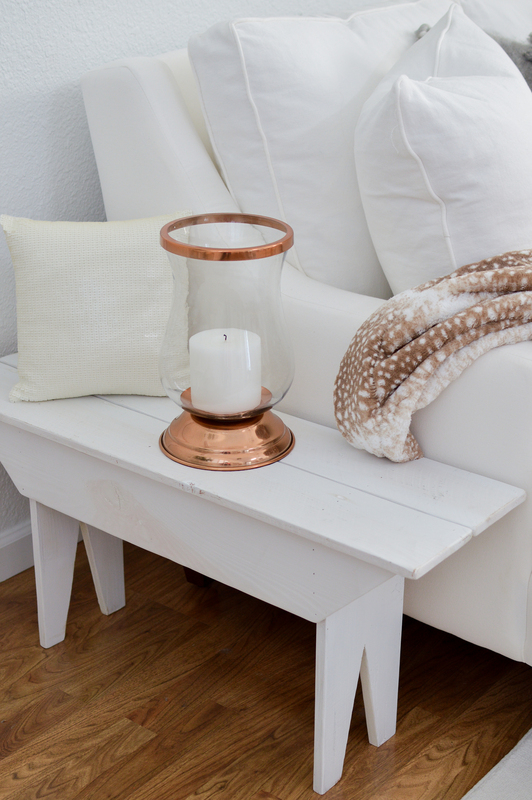 where did you buy the hurricane lamp with the copper bottom and copper rim? I didn’t see it in your list of products from Better Homes & Garden. hope you can let me know where you bought it! 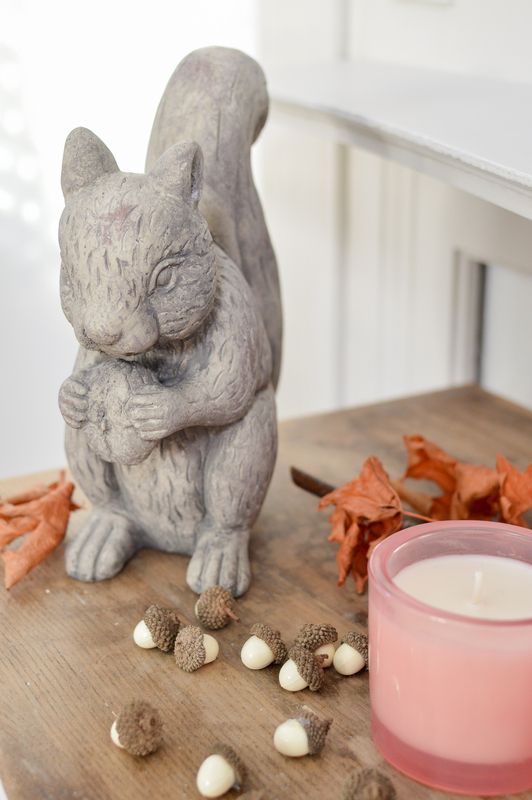 Can you tell me about the acorns?? I think I picked those up at HomeGoods last year in a tiny clear plastic box. It looks marvelous! I think I need to make you a sign in blush. It shall say “Bliss”. Consider it marking my territory. haha. You are so silly! Well I kind of thought it was my responsibility to stretch a little and show an alternative besides my fall-back of playing it safe, and going blush instead of for the safe grey. There is no wrong choice, they were all beautiful colors. The fireplace is done in Worldly Grey from Sherwin Williams. 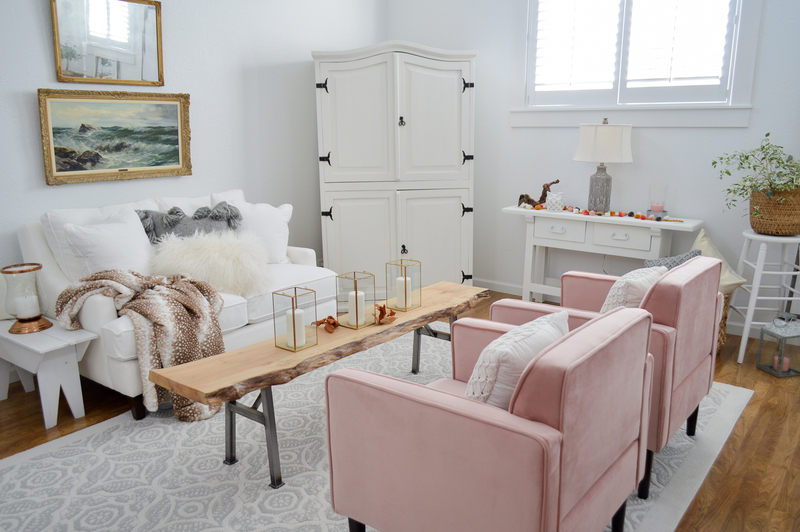 Such a pretty room and I adore the coffee table! and lanterns!!! 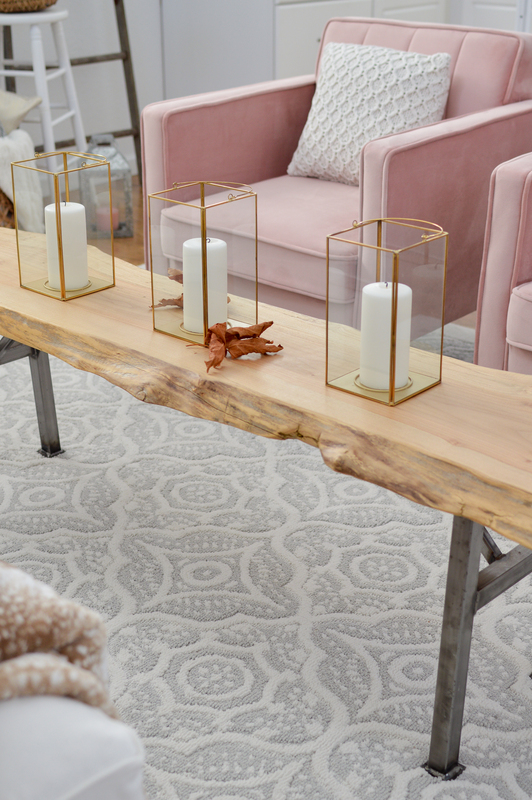 I will make sure to tell my husband you liked the table he made. oh I am in love….with a chair. they and the whole room are gorgeous! It looks beautiful Shannon! That shade is so pretty goes great with gold/brass tones. But you mentioned emerald? I have a thing for deep green…..I’ve got to go look. Yes! An emerald with a pinch of teal. It’s positively luscious. Love your chairs!!! The room looks beautiful!! I need some blush in my life!! I did too and I’m so happy with these beauties! 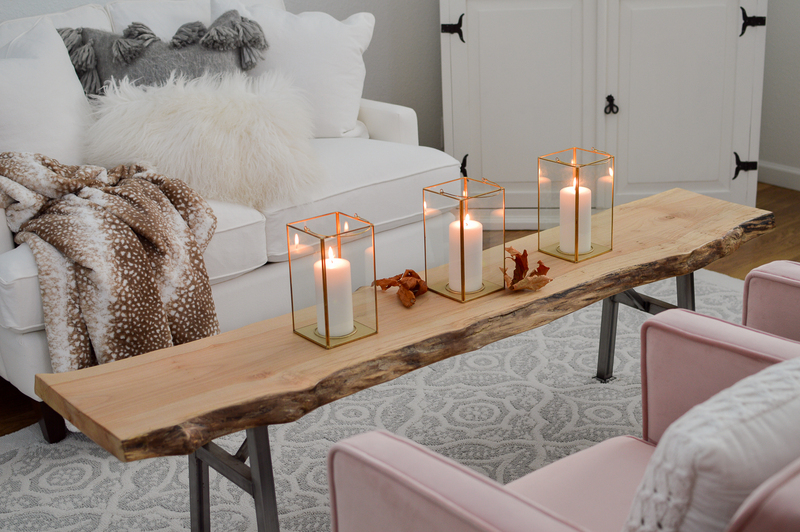 Fall Decorating Ideas To Blush Over. 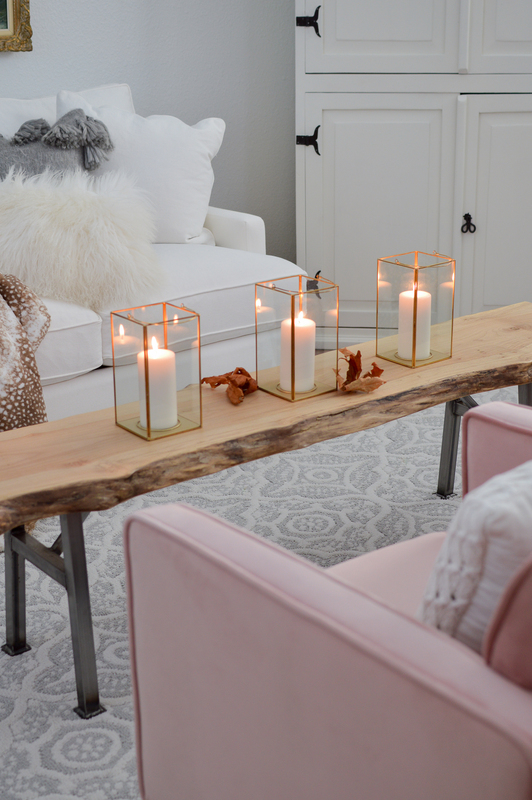 Want to incorrorate blush pink into your home decorating? 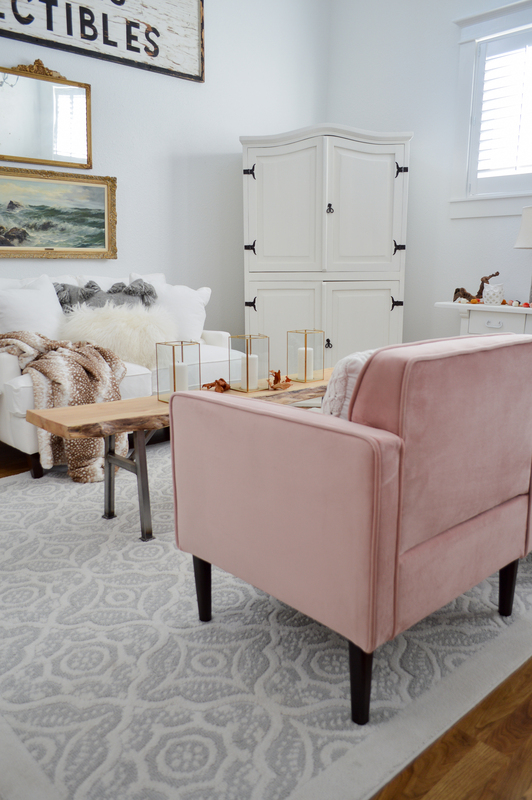 I'm sharing how I added pink velvet furniture, on a budget!